Last night Walter and I were invited to a very special Jean Harlow Junkies mixer at 512 N. Palm in Beverly Hills, the last house she lived in before her untimely death in 1937. 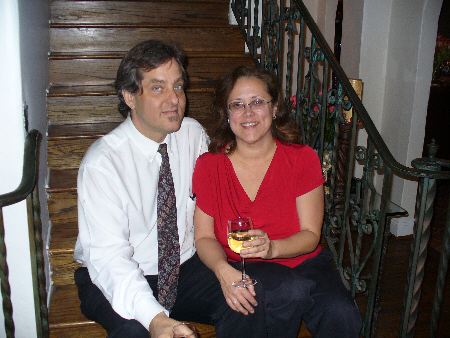 Here we are sitting on the staircase just inside the front door. If I didn't take photos I would have woken up this morning thinking it had all been a dream: To walk the hardwood floors that Jean herself once did, to stand inside the bedroom where she grew increasingly ill before being taken to Good Samaritan Hospital. And to think of the happier times she hopefully spent inside those walls. This is just a sneak preview to a full article I'm working on for The Platinum Page to be posted this weekend. Stay tuned! In the meantime, very special thanks to our hosts, Mark & Nancy Walsh (who just listed the house for sale this week) and my buddy Scott Michaels for making it all possible!